We have recently undertaken an exciting project for our client Intuit, a leading retailer of accountancy software, which entailed a strong delivery under tight time constraints. Intuit’s group marketing manager Jude was scheduled to deliver a keynote speech at London’s annual Accountex exposition which is attended by thousands of accounting professionals and held at the ExCeL centre in the Docklands. Accountex is Europe’s leading accounting exposition with at least 100 dynamic exhibiting companies, offering a diverse range seminars , talks and workshops. Last This year it attracted over 4000 visitors. The focus of Jude’s presentation was to be the changing role of accountants and their relationship with their clients over the next 5-10 years. 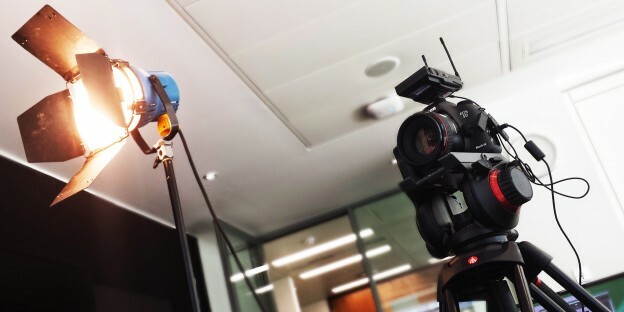 As such she wanted interview footage with both accountants and small business owners to gather their responses to the shift in dynamic which is already underway. 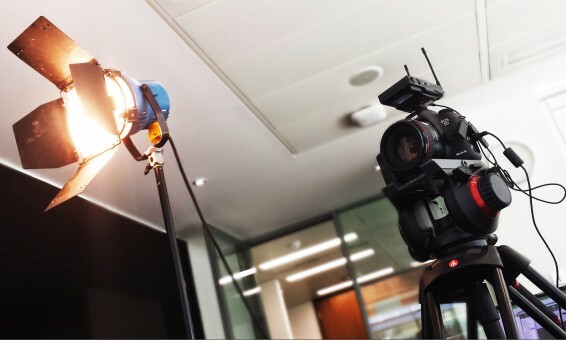 Our initial brief was to film these interviews and edit the resulting footage into soundbites to be embedded into a Powerpoint presentation that we were also designing. We decided that in order to do things properly, we required the proper kit so looked to a fantastic London based camera hire company to rent out some equipment. So after obtaining a great deal on hiring top end gear, off we trundled to London to get things under way. We carried out some great interviews with some interesting individuals who provided some fantastic insights. As one who is generally averse to numeracy, even I was slightly caught up. For us, it was a great opportunity to showcase our versatility as a creative industry by undertaking a project that was out of our comfort zone and afforded us the chance to learn and grow. 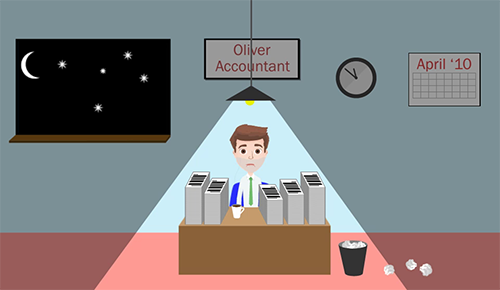 She felt that this shift in dynamic should be represented in her speech by charting the journey of a fictitious accountant named Oliver, and asked us to create some graphics to visualise this in her presentation. So, I proposed a flat animation that followed the character, and highlighted the key elements of the change. I am comfortable to admit that I walked away feeling pretty excited about the project and the exciting prospects of a new challenge. Yet, by the time I reached home, I realised just how much I had agreed to undertake, with minimal time to get the job done. Such is life. 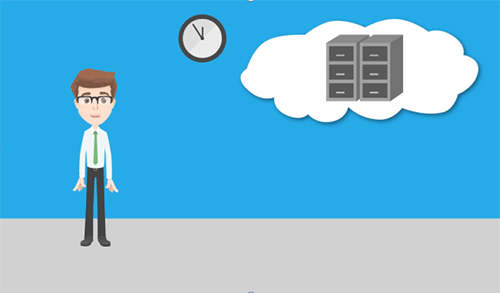 So the brief grew from a relatively simple video edit and Powerpoint presentation to a slightly more demanding and complicated graphical animation, with video editing and Powerpoint still in the mix of course. 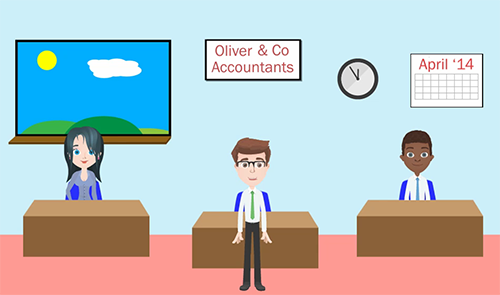 I settled on creating 5 or 6 small animations that represented the change in how accountancy is done these days; shifting from endless piles of paperwork and receipts through to the integration of social media, cloud storage and sourced technologically skilled labour. This highlighted Jude’s key point for her presentation regarding the role change of accountants from number crunchers to consultants. It was an exciting challenge, and I’m happy to say that it was completed to a high standard and within the time restraints. And Jude was thrilled with the results, which is of course the main thing. This project required the dedication and collaboration of several members of our team, and we are not too proud to blow our trumpet about this: we have a great team that achieves great things. With the work completed, I trotted off to London’s ExCeL Centre to see Oliver’s big debut, and to support Intuit at their event. I’m pleased to say that Oliver, and Jude, did excellently. Jude’s presentation was dynamic and engaging, and was complimented brilliantly by our graphical input. It was fantastic to see our hard work come to fruition and witness the final result in situ for a project that was slightly different from our usual milieu. As a small business, it is essential really that we be willing to try new things, and open to expanding our collective skill set in order to maintain competitiveness in the industry. It is always a risk, jumping into the somewhat unknown, but certainly in this instance, the risks paid off. We hope that this will lead to more similar projects that will allow us to flex our creative muscles in new and interesting ways. You can see some of the animations below, we’d love to hear your thoughts on them.